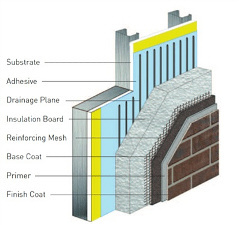 According to the definitions of the International Building Code and ASTM International, an Exterior Insulation and Finish System (EIFS) is a nonload bearing, exterior wall cladding system that consists of an insulation board attached either adhesively or mechanically, or both, to the substrate; an integrally reinforced base coat; and a textured protective finish coat. EIFS with Drainage, another EIFS system, is the predominate method of EIFS applied today. As the name implies, EIFS with Drainage provides a way for moisture that may accumulate in the wall cavity to evacuate. 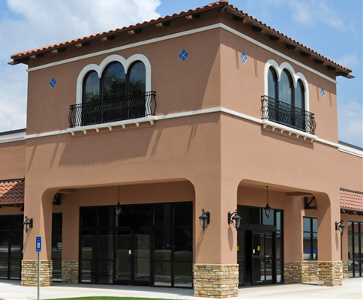 EIFS today are one of the most tested and well researched claddings in the construction industry. Research, conducted by the Oak Ridge National Laboratory and supported by the Department of Energy, has validated that EIFS are the "best performing cladding" in relation to thermal and moisture control when compared to brick, stucco, and cementitious fiberboard siding. In addition EIFS is in full compliance with modern building codes which emphasize energy conservation through the use of CI (continuous insulation) and a continuous air barrier. Both these components are built into today's EIFS products to provide maximum energy savings, reduced environmental impact over the life of the structure, and improved IAQ, Indoor Air Quality. Along with these functional advantages come virtually unlimited color, texture, and decorative choices to enhance curb appeal and enjoyment of almost any home or structure. 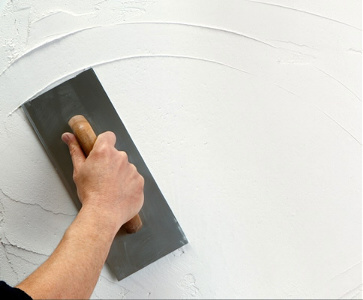 Ray’s Plastering Inc. is a stucco and plastering company that does commercial applications. Ray’s Plaster Inc. can stucco any exterior walls and plaster any ceiling or interior walls of commercial buildings. Ray’s Plastering Inc. applies new stucco and plastering as well as stucco repair, water damage stucco repair, leaking stucco repair, broken stucco screeds repair, rusty stucco screeds repair, stucco screed repair, plaster repair, plaster ceiling repair, and plaster wall repair. Ray’s Plastering Inc. is certified and members of EIFS Mechanics’ Certificate, EIFSmart Contractor, Building Trades Association Member, and Building Trades Association. Ray’s Plastering Inc. is certified applicators for the brands Dryvit, STO, and Senergy. Ray’s Plastering Inc. services the areas of Ashland, Russell, Flatwoods, Bellefonte, Worthington, Westwood, Catlettsburg, Ironton, Coal Grove, South Point, Burlington, Chesapeake, Kenova, Ceredo, Huntington, Proctorville, and surrounding communities in Ohio, Kentucky, and West Virginia. Ray's Plastering Inc. also serves the states of ARIZONA, AZ, ARKANSAS, AR, CALIFORNIA, CA, COLORADO, CO, CONNECTICUT, CT, DELAWARE, DE, DISTRICT OF COLUMBIA, DC, FLORIDA, FL, GEORGIA, GA, HAWAII, HI, IDAHO, ID, ILLINOIS, IL, INDIANA, IN, IOWA, IA, KANSAS, KS, KENTUCKY, KY, LOUISIANA, LA, MAINE, ME, MARYLAND, MD, MASSACHUSETTS, MA, MICHIGAN, MI, MINNESOTA, MN, MISSISSIPPI, MS, MISSOURI, MO, MONTANA, MT, NEBRASKA, NE, NEVADA, NV, NEW HAMPSHIRE, NH, NEW JERSEY, NJ, NEW MEXICO, NM, NEW YORK, NY, NORTH CAROLINA, NC, NORTH DAKOTA, ND, OHIO, OH, OKLAHOMA, OK, OREGON, OR, PENNSYLVANIA, PA, PUERTO RICO, PR, RHODE ISLAND, RI, SOUTH CAROLINA, SC, SOUTH DAKOTA, SD TENNESSEE, TN, TEXAS, TX, UTAH, UT, VERMONT, VT, VIRGIN ISLANDS, VI, VIRGINIA, VA, WASHINGTON, WA, WEST VIRGINIA, WV, WISCONSIN, WI and WYOMING, WY. Copyright © 2015 Ray’s Plastering Inc. All Rights Reserved. Designed by GraFitz Group Network - Website Design.